The Escapist Fifth Anniversary Photo Mosaic Needs Your Photos! The Escapist is turning five years old, and to celebrate we're making a giant photo mosaic using photographs you submit! The 5th Anniversary of The Escapist is fast approaching, and this year we want to get everyone involved! We will be creating a photo mosaic from pictures of you, our users. To get an idea of what we're going for, take a gander at the mosaic Blizzard produced for World of Warcraft's five year anniversary. Ours will be much like that, except with less orcs and more ponies. Just take a snapshot of yourself that shows your love for The Escapist. 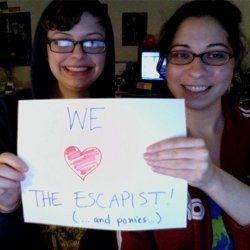 The photo can be of anything you want - as long as you're showing your love for The Escapist! Remember to keep it clean, folks (please see included photo for an example). If you're wary of showing your face on the internet, don't fret - you can snap picture of your dog, your favorite stuffed animal, anything. The pictures must be submitted in JPG format and be 504 x 360 pixels wide (7" x 5"). You can submit multiple photos, and make sure to fill in the title field, otherwise it will not go through. To participate, simply log in to The Escapist and submit your photos at this link. We are accepting submissions until June 30th, so start snappin'! Photos will be available to look at in a special gallery, so if you're out of ideas, feel free to browse here for some inspiration.